Would your school like to become a Cycle Against Suicide Ambassador School in 2018-19? The Ambassador School Programme established in 2013 aims to encourage schools to become actively involved in mental health promotion. The programme provides a framework, structure and incentive for schools to integrate mental health activities into their school planning and rewards schools that go the extra mile. Read our 2018-19 Ambassador brochure. 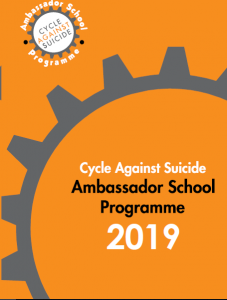 If you’d like to read more about this opportunity for your school or if you need any support throughout the year, please contact our Ambassador School Co-ordinator katie.carr@cycleagainstsuicide.com. To Register to become an Ambassador School for 2018-19, Please provide your details Here. Congratulations to all the schools that were recently awarded Ambassador School status at our ceremony in the Kings Inns.